Seeing Milan from above is a unique and exciting experience; you can catch details that even those who have lived in the city for a long time have never seen. Studio BBPR’s 1958 skyscraper outdoes ‘80s Memphis in the post-modern quoting stakes. 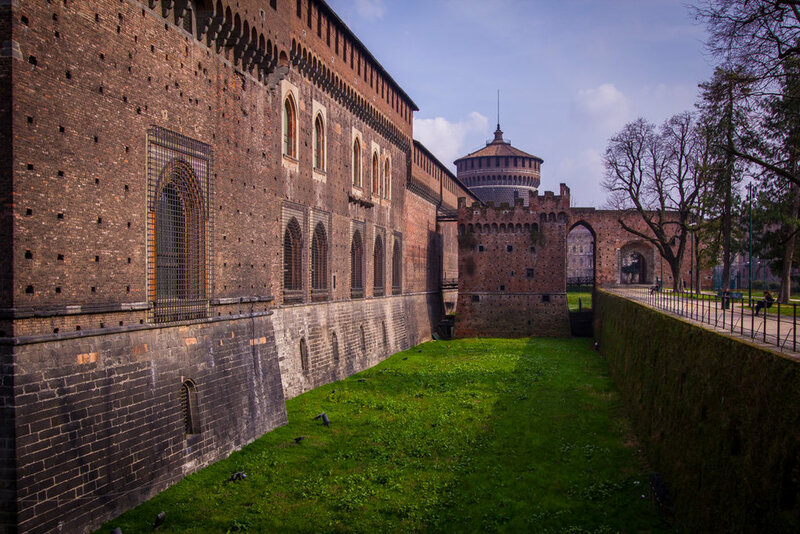 The top-heavy tower camply tilts at Castello Sforzesco and the Duomo’s lovely buttresses. Slightly sinister, ever so sci-fi and cleverly maximising use of available footprint, it’s Lombard to the core. Sadly, apart from the foyer, it’s currently as unbreachable as the medieval fortresses it emulates. Duomo. It is worth going up to the roof terraces to view the breathtaking panorama that appears before your eyes. The entrance to the stairs is behind the Duomo. You can go up on foot or by lift. The most spectacular view is through the innumerable marble spires and pinnacles that adorn the rooftop. A vision in pink Candoglia marble, Milan's cathedral aptly reflects the city's creativity and ambition. Its pearly white facade, adorned with 135 spires and 3200 statues, rises like the filigree of a fairy tale tiara, wowing the crowds with extravagant detail. The vast interior is no less impressive, with the largest stained glass windows in Christendom, while below is the early Christian baptistry and crypt, where the remains of the saintly Carlo Borromeo are on display in a rock crystal casket. Just a short walk from the Castello Sforzesco, in Parco Sempione, not for from the Triennial building, stands the Torre Branca. The tower, designed by Giò Ponti, is considered a true work of art and its viewing deck provides a striking view of Milan from above. Torre Branca is a 108m-tall steel tower raised in 1933, from the top of which you have a wonderful, bird’s-eye view of the city.